Treehouse is an affordable online technology education that allows people to begin or advance their courses in web design, mobile development, and game development among others. There are experienced teachers who will provide courses for all those who want to learn coding. The teachers are experts in the relevant fields, and they teach each student at their own pace. If you would want to become a teacher, you can sign up and start teaching a course that you are conversant with. If you have any topic in mind, contact Treehouse, and you can use your talent to make a living. 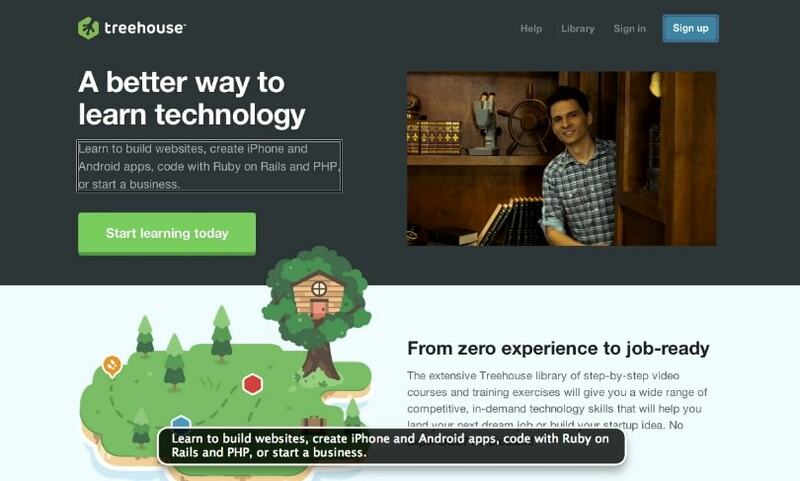 Treehouse has revolutionized how people learn coding, web design, iOS and so much more. One of the key advantages with Treehouse is the fact that it is very clear and detailed. As such, learning has a lot of reinforcement and you will be taken through each step at your pace, until you understand the concept. Treehouse adapts teaching methods that are easy to follow and understand. This makes it easier for the teachers to interact with the students. All the teachers are friendly and will be willing to answer any type of questions that you may have in regards to the course that you are taking. You will have access to the forum with frequently asked questions about any class, which can be very helpful. You will also have access to high quality videos with worthwhile content. The graphics that teachers use to explain details are clear and neatly done, such that everything is visible. The teaching process is quite interactive with many coding quizzes and challenges. As such, this breaks the monotony and allows you to take up some practical coding challenges. With the Treehouse platform, the objective is not just to teach you how to write a code and let you go; you will learn how to code. The main objective is to ensure that at the completion of the course, you can start your career right away. Some of the courses are outdated and the structure of learning can be limiting since you have to pass a particular unit before advancing. The choice of classes is quite limited and the library cannot compare with similar platforms like Udemy or even Lynda. The courses on Treehouse only revolve around mobile and web development. Other components of programming are not included. Most classes are only suitable for beginners, not those who want to advance. Grant access to the supportive community of students. If you are not sure if this is the plan that suits your needs, you should start with the 7 days free trial. Download videos, which you can watch offline. Treehouse is certainly a great platform for software and web development. This is a great platform for the beginners who are interested in coding. There is a good level of student engagement, and the platform also allows the teachers and students to interact. The courses are clearly outlined, and each student learns at their own pace. Treehouse is a great place for students to not only learn the skills but start their career. However, it is limited in terms of the courses, and the library is not as equipped as the one on Lynda or Udemy. Over and above, this is a platform that is worth giving a shot.